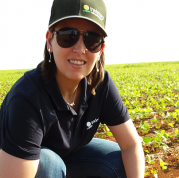 Camila Levy, R&D Agronomical Manager at Tradecorp, will be giving a speech at New Ag Dublin, this March, where she will explain the key concepts of this technology. “Innovative Solutions for Crop Nutrition Involving Foliar Application” focuses on a new way of implementing foliar application of nutrients. This new range of foliar fertilizers is based on novelties that allow a high affinity of the foliar fertilizer to the plant cuticles, which allows for a precise delivery and a better nutrient absorption. Question – What are the origins of this investigation? Answer.- This project stemmed from previous research that was conducted back in 2009 in Brazil by the internal team. Our work was focused on finding new raw materials for seed treatment products. The goal was to increase the absorption of some nutrients by the plants without using higher doses. After internal research, we began working with Dr. Victoria Fernandez at the UPM in Madrid, especially for foliar application of the same formulations. Today, we have understood that the physical-chemical properties of the formulations are more important than the size of particles applied. By using this knowledge from several years of research, we are about to launch a new range of those formulations, aiming the great ratio between elements applied and absorbed via foliar. Q. – What was Tradecorp’s objective when investigating this new concept? A.- Innovation in crop nutrition is a fundamental aspect in the agronomical sector. We do not need to increase the amount of land we use, but learn to work better on the land we already have. By maximizing technology we can increase the yield and quality of crops. In Tradecorp, we strongly believe in the role of innovation for the future of agriculture, and this new technology is like fine tuning for crop nutrition. These innovative formulations are a way of bringing elements in an assertive way, and is a huge step towards the future of crop nutrition.